Researchers from the University of Southampton will take part in an international, three-day festival later this month to deliver a unique line-up of talks, demonstrations and live experiments to public houses across Southampton. ‘Low-cost medical diagnostics… at home’ – learn how advanced laser technology is being utilised to produce a home use device that can diagnose multiple medical conditions in a single test. Southampton pubs supporting this year’s ‘Pint of Science’ programme include The Ship Inn (Redbridge), The Duke of Wellington (Bugle Street), The Mitre (Portswood), The Brewhouse & Kitchen (Highfield), The View (Thornhill Road) and Ebb and Flow (Above Bar). Alongside main talks at every venue, each evening will also include a range of fun, science-related activities including pub quizzes, hands-on activities, brain teaser tests, pint-sized experiments and other interactive games. 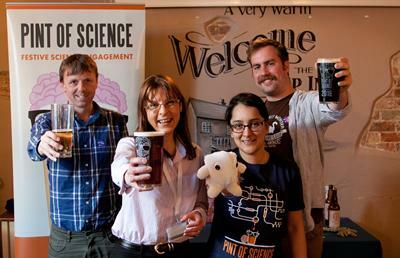 ‘Pint of Science’ was established four years ago by a group of UK-based postgraduate and postdoctoral researchers and now involves universities in over 20 towns and cities across the country with activities extending to a further 100 cities in Europe, North and South America, Africa and Australia. Tickets for ‘Pint of Science’ activities in Southampton are available online from www.pintofscience.co.uk/city/southampton with each evening costing only £4.